Q: According to media reports, this week US President Trump is possibly going to decertify the Iranian nuclear deal. As one of the key countries involved to ensure the passage of this deal in 2015, is China concerned that the deal that was reached after so much hard work would be affected due to this move? A: We made remarks on the Joint Comprehensive Plan of Action (JCPOA) at request before. The JCPOA is an important outcome of multilateralism and a model of peacefully resolving international hot-spot issue through political and diplomatic means, which has played a key role in upholding international non-proliferation regime and the peace and stability of the Middle East region. We hope that all relevant parties can properly resolve their differences and jointly uphold and implement the JCPOA. Q: According to reports, in response to the Korean Peninsula nuclear issue, US President Donald Trump said on Twitter over the weekend that agreements between the US presidents and their administrations and the DPRK in the past 25 years have been violated before the ink was dry, and the US has wasted massive amounts of money and effort. He said only one thing will work. Some have associated this with what President Trump said to Secretary of State Rex Tillerson before, that is, trying to open the door of negotiating with the DPRK is a waste of time. Many have taken this as a signal that the US may resort to force. How do you comment on that? A: We have noted the recent remarks of various parties, including an article published in the Washington Post written by former US President Jimmy Carter which said that the US should offer to send a high-level delegation to Pyongyang for peace talks or to support an international conference including the relevant parties at a mutually acceptable site. Moreover, there are reports that the results from the Gallup snap poll of 14 countries suggest the vast majority supports the effort to pursue diplomacy and find a peaceful solution to the Korean Peninsula crisis. The current situation on the Korean Peninsula remains highly complex and severe. We hope that various parties can strictly observe and implement the UN Security Council resolutions, refrain from provoking each other and aggravating the contradiction, exercise restraint and caution to ease the tension. We have stated multiple times that the core and essence of the Korean Peninsula are security issue. We shall not forget our original aspiration if we want to resolve the Korean Peninsula nuclear issue. A revisit to the September 19 Joint Statement of 2005 will lead to the conclusion that as the two main directly concerned parties, the US has mainly called for the DPRK's promise to abandon all nuclear weapons and existing nuclear programs while the DPRK has put its chief concern on the US'confirmation that it has no intention to attack or invade the DPRK with nuclear or conventional weapons. So to speak, the original aspiration of both the DPRK and the US is security. To our regret, in the process of pursuing this goal, they have lost the track due to various reasons and the knot tied even more tightly. Only by remembering the original aspiration can we keep pressing ahead. This also applies to the Korean Peninsula nuclear issue. Only by addressing the legitimate security concern of various parties in a balanced manner can we truly open the door to peacefully resolving the Korean Peninsula nuclear issue. To this end, various parties need to show more sincerity, sit down at the negotiating table, enhance mutual trust through dialogue and seek a viable way out for peaceful settlement of the Korean Peninsula nuclear issue through negotiation. Only by doing that can we find a fundamental solution to the Korean Peninsula nuclear issue, uphold the general peace and stability of the Korean Peninsula and this region and best serve the common interests of the relevant parties. Q: It is reported that a recent statement issued by Philippine Department of Finance said the Philippines will issue yuan-denominated bonds worth of 200 million US dollars in China by around November of this year. The Philippine side is very thankful for the assistance provided by the Bank of China, and this is the first of many such bonds in the future. How do you comment on that? A: Since the overall turnaround of China-Philippine relations last year, cooperation in various fields between the two countries have thrived. China welcomes the Philippine Department of Finance's move to strengthen cooperation with Chinese financial institutions and issue yuan-denominated bonds in China. We believe the relevant measures will help deepen our cooperation on finance and investment and boost the Philippines'infrastructure construction and advance the China-Philippine relations in an in-depth way. Q: Over the weekend, the Indian defense minister visited the Nathula pass in the Sikkim section of the China-India boundary and had friendly interactions with the Chinese soldiers. What is your comment? A: The Sikkim sector of China-India boundary has been delimited by the historical treaty of 1890, and the Nathula pass has been the best witness testifying to this fact. 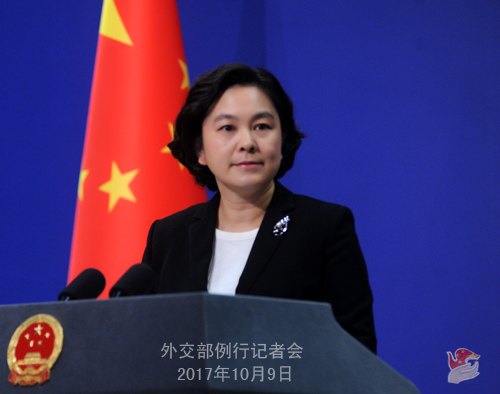 The Chinese side is willing to jointly uphold peace and tranquility in the border areas with the Indian side on the basis of observing historical treaties and the relevant agreements and accords between the two sides. Q: Recently, the US government has announced the lifting of economic sanctions on Sudan. What's your comment? A: We have noted the US'announcement to lift its economic sanctions on Sudan and we welcome that.